Looks like a CUBE... who says "God doesn't play DICE."????? 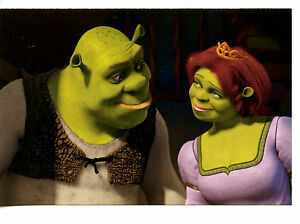 Wow, I had no idea this was in train! Sounds like a great mission! <<Hayabusa2's MASCOT (Mobile Asteroid Surface Scout) was developed by the German Aerospace Center in cooperation with the French space agency CNES. It measures 29.5 cm × 27.5 cm × 19.5 cm and has a mass of 9.6 kg. MASCOT carries an infrared spectrometer, a magnetometer, a radiometer and a camera, and is capable of hopping to reposition itself for further measurements. A Phillies fan was hit in the face by a flying hot dog from the Phanatic’s iconic hot dog gun on Monday night at Citizens Bank Park, and was sent to the hospital. <<When the Phillie Phanatic rolled out onto the field at Citizens Bank Park on Monday night in the middle of the Philadelphia Phillies’ game against the St. Louis Cardinals, fans jumped to their feet. The big green mascot came out with his hot dog launcher, and was about to launch them into the stands. WOW! VERY interesting! Can't wait to hear about this SPACE CRUMB! All pictures show view at nearly the same angle. Is that by by careful choice of pictures or because asteroid has very low angular momentum? All pictures show view at nearly the same angle. Is that by by careful choice of pictures or because asteroid has very low angular momentum? There are 4 groups of 3 pictures shown at nearly the same angle. The rotation period is ~ 7 hours 38 minutes. Makes me wonder why we haven't landed telescopes/cameras/instruments on asteroids and let them travel to the far end of the solar system and send back images/data? I think it looks like a marshmallow. Asteroids aren't going to any interesting places and it would take too much energy to capture them and divert them to some place interesting. Better to simply visit, explore, and return with a box. Chondrules in a chondrite meteorite. A millimeter scale is shown. <<The various planets are thought to have formed from the solar nebula, the disc-shaped cloud of gas and dust left over from the Sun's formation. The currently accepted method by which the planets formed is accretion, in which the planets began as dust grains in orbit around the central protostar. Through direct contact, these grains formed into clumps up to 200 metres in diameter, which in turn collided to form larger bodies (planetesimals) of ~10 kilometres in size. These gradually increased through further collisions, growing at the rate of centimetres per year over the course of the next few million years. A planetesimal is a solid object arising during the accumulation of planets whose internal strength is dominated by self-gravity and whose orbital dynamics is not significantly affected by gas drag. This corresponds to objects larger than approximately 1 km in the solar nebula. Is the axis of rotation of Ryugu such that the equator and poles line up with its rather biconic shape? That seems clear from the APOD's dozen images. On June 27, 2018, JAXA operated Hayabusa2 chemical propulsion thrusters for the spacecraft's orbit control. 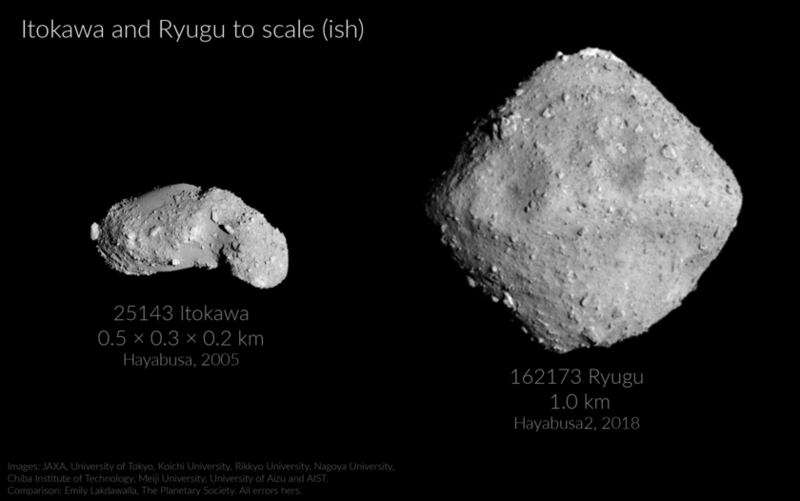 http://www.planetary.org/blogs/emily-lakdawalla/2018/0627-hayabusa2-arrived-at-ryugu.html wrote: Itokawa and Ryugu comparison: Emily Lakdawalla, The Planetary Society. The two target asteroids of Hayabusa and Hayabusa2, compared. The comparison is based on less-than-precise information on the scales of the two images; it may be updated with another version once better scale information is available. Images: JAXA, University of Tokyo, Koichi University, Rikkyo University, Nagoya University, Chiba Institute of Technology, Meiji University, University of Aizu and AIST. You can imagine what wide scale asteroid mining will do to the metals markets. 16 Psyche is the prize here, it's a big chunk of iron and nickel and likely lots of other good stuff. Gold, silver, platinum, etc. prices would drop like crazy. Countries with gold stockpiles will find them comparatively worthless. I don't think any country would even try it considering these repercussions, or would at least divest well in advance. Almost everything the asteroid is made of is much, much cheaper to mine on Earth (and is generally abundant here). It's going to be a long time before asteroid mining is going to make sense for iron, nickel, or precious metals. I expect any movement in that direction will be towards rare earths, which are in increasing demand and are largely controlled by just a few countries. Ambitious Hayabusa2 is carrying an armada of separable probes, including two impactors, four small close-proximity hoverers, three small surface hoppers, and the Mobile Asteroid Surface Scout (MASCOT) which will land, study, and move around on Ryugu's surface. How do the hoppers hop? Hayabusa2 is carrying an armada of separable probes, including two impactors, four small close-proximity hoverers, three small surface hoppers, and the Mobile Asteroid Surface Scout (MASCOT) which will land, study, and move around on Ryugu's surface. Thanks Art. The JAXA website said the MASCOT can hop too, but only once. I assume that means it's not using reaction wheels for its motion or only has enough power to use them once? Anyway, it's a very clever means of moving about, especially in micro-gravity. One reaction mass... primarily to orient itself. Valid points, if such asteroidal material where to flood the markets. Read the prospectus carefully before you invest. The real usefulness of such a pile of materials would be out in space though, where it costs a great deal to launch anything into orbit. The real usefulness of such a pile of materials would be out in space though, where it costs a great deal to launch anything into orbit. The real usefulness of such a pile of materials would be for local consumption by visitors/colonists.